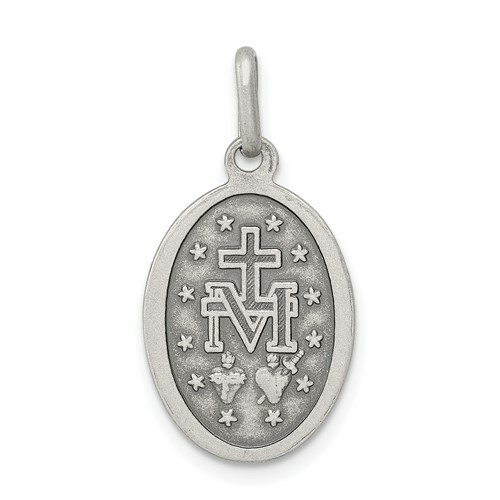 This small oval sterling Silver miraculous medal has a satin and antique finish. Measures 5/8 inch tall by 7/16 inch wide without bail. This item is smaller than a dime. Chain not included. Weight: 1.7 grams. Made in Italy. I purchased this me. It was one of the pretties medals I had seen and couldn't resist. Joy Jewelers was great to work with; shipped quickly and safely. Thanks for a wonderful experience. This was a baptism gift. I was very pleased by the quality of this medal...well made. I wear my Miraculous Medal at all times - I love how close I feel to God just wearing it. This is for a rosary bracelet, and searched a while for this size. Bought a crucifix here, and immediately found this.|Love it, made in Italy and couldn't be happier. This medal conforms to the original design and is well made. Use as a bracelet charm along with other bracelets. This medal contains all the correct images and words that are unique to the Miraculous Medal. Great price for a silver medal. Appreciate being able to get it in a smaller size as it was a gift for a young girl. Love it! Great size & holding up well to constant wear. Very happy with my purchase!